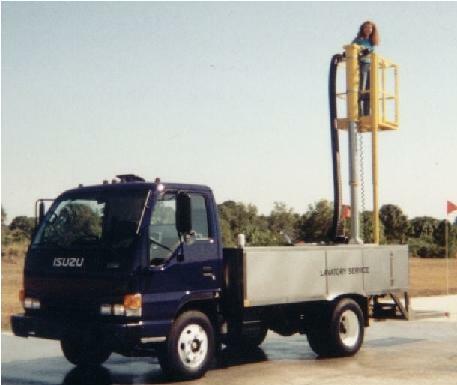 The Phoenix TL600 lavatory service truck is designed to service all sizes of commercial aircraft. A manlift option is required to service wide body aircraft. Phoenix uses a two tank system for lavatory servicing. The waste tank and flush tank are separate components fabricated from 304 stainless steel and are baffled in both directions. A hinged cleanout cover is provided on the waste tank for easy access to the dump valve to remove impediments. The waste tank has a tray to store the waste hose and prevent spillage of waste onto the top of the unit. The flush system uses an electrically actuated clutch to provide power for the hydraulic system that powers a bronze gear drive water pump. The system is actuated by mechanical switches at the service end of the vehicle.